Just Conservation - 'View from the Termite Mound' responds to the paper on the Serengeti-Mara Squeeze. "These results come at the right time, as the Tanzanian government is now taking important steps to address these issues on a national level,". So, this makes the article very much look like a reaction to President Magufuli’s late and vague statement that he can even consider removing some protected areas - with yet unknown consequences for Loliondo (if any) as persecution under his rule has been worse than ever - since he’s so unhappy to see pastoralists and cultivators being evicted all over the country. I suppose the TAWIRI director could also have meant that the article will – together with terror, intimidation, and shameless lies – assist the government side in the East African Court of Justice, defending human rights crimes and land alienation plans. I hope the article wasn’t written because of worries that Otterlo Business Corporation (OBC) won’t get any further in their lobbying for land alienation and human rights crimes now when the director has been charged with economic sabotage crimes. William Mwakilema, one of the co-authors, is among those responsible for the illegal evictions of 2017 and its many human rights crimes. In Arusha, according to the Daily News, one of the co-authors, Han Olff, held a press conference at the headquarters of TAWIRI, and together with (which says more than any words that I’m trying to understand) the spokespersons of the Ministry of Natural Resources and Tourism and of TAWIRI, and with the director of TAWIRI (mentioned above) where the ministry spokesperson, Doreen Makaya, reportedly mentioned the president’s “goodwill” about people settling in protected areas and hoped that the sectoral team will identify areas where people could settle while others might be given an alternative land, if they are settling in a “dangerous area” within protected areas. I don’t know if this means that she actually sees the possibility of people being allowed to settle in any area of Serengeti Natural Park, which would be totally unprecedented, if you don’t count unofficial “permits” from rangers making extra money. But, why then would the team have to come and inspect the 1,500 km2 Osero (bushland), which isn’t even a protected area and should already have been declared safe from any alienation? I’m not sure if anyone knows exactly what’s going on, but the president’s statement has caused a stir. The TAWIRI spokesperson, Janemary Ntalwila, reportedly talked about raising awareness among communities around the ecological areas, and specifically the greater Serengeti-Mara ecosystem, and that if wildlife decreases in Serengeti, it would mean reduction in tourism activities and revenue to the government. Co-author Han Olff announced that the article writers were now ready to offer advice so that the greater Serengeti-Mara does not collapse. which he added would not even benefit the people living in the areas. It seems obvious that the publishing of the article was accompanied by a press release that even reached the British gutter press, and that the message was of new and view-altering findings about how the world’s most iconic ecosystem is being squeezed. Though the brief article is written by thirteen co-authors that have compiled 40 years of research, and I doubt that there are many people on this planet that hadn’t already heard that the increase in human population and activities at the edges negatively affect the core of protected areas. It wasn’t news to the readers of the Daily Mail that already had their cures (for population growth) made up as a new lethal virus affecting humans, or actively preventing successful development of a malaria vaccine. Though such views are also found in more serious newspaper comments fields and conservation orientated social media, and these generally are less harmful than the actual article. That was the first coverage I saw in my news feeds, and then I lost count of the very many articles, none of them critical in any way, unless I’ve missed something. The findings presented in the article may seem uncontroversial, and I don’t have any way of disproving anything, so I must assume that they are correct, even if the personality of some co-authors suggests that anythingcould be going on. In short, the research has found that high human and livestock density, and activity, at the edges of the protected areas of the Serengeti-Mara ecosystem has squeezed wildlife into the core of these protected areas and that higher grazing pressure has increased less palatable and nutritious vegetation also in the core areas, beneficial natural fires have been reduced, less carbon dioxide and nutrients are stored, and the whole system is less resilient. While this has not resulted in a decline in the number of migrating wildebeest (except on the Kenyan side where co-author Ogutu seems to have found otherwise), it doesn’t bode well for a future with more drought and further climate change. 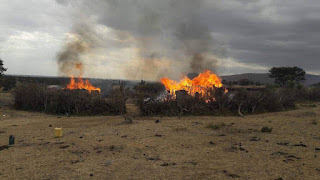 The article deals with Narok in Kenya, Loliondo, Ngorongoro Conservation Area, and the western boundary (Mara and Simiyu regions), mentioning Narok as the worst case and NCA as the less seriously hit. Though, as known, this blog is about Loliondo; it’s because of violence and attempted land alienation in Loliondo that the Tanzanian government has been sued in the East African Court of Justice; and one of the co-authors is on an extremely brutal mission against the Loliondo Maasai (see below). In the article “hard-edges” are found undesirable, and “soft-edges” where wildlife can thrive outside protected areas are recommended, but these soft-edges are only advocated for in one direction, while “hard-edges” against herders trying to save their cattle in times of drought being met by “strict border control” isn’t described as anything other than beneficial and desirable. Grazing livestock in Serengeti National Park is strictly prohibited but has occurred when rangers have been taking bribes. The “hard edges” of Serengeti National Park are often enforced with astronomical fines and rangers brutally beating herders. In a most unsettling way, the Science article maps Loliondo Game Controlled Area with the same acronym as Ngorongoro Conservation Area (NCA) – “PASRU” (“protected area with sustainable resource use”) – when Loliondo GCA is an unprotected area, even if there currently is a serious threat in the form of a decision by PM Majaliwa to place Loliondo under NCA, which fortunately has been delayed. The way ahead in the article is presented as ambitious land use plans to actively manage resources beyond protected area boundaries, adding that “strategies where humans and wildlife share landscapes under conditions established and enforced by the mutual agreement of local people and regional or national governments are likely the way forward”, and that this “will require continually monitoring both the ecological integrity and societal trends in the surroundings”. What people are supposed to get in return for being managed by huge carbon footprint central government and international conservation types is,“building more trust with local communities that they will keep sharing in the benefits of natural resource conservation”, and “ensuring that livestock numbers, settlement, and cropland expansion in the direct vicinity of core protected areas do not go beyond a point where they impair the key structure and functioning of the underlying socioecological system”. There’s no mention of regaining access to grazing in the national park, and I’ve in social media noticed that just mentioning such a thing is the biggest taboo imaginable. People will “keep sharing”(whatever that means) benefits of natural resource conservation on their own land. The authors of this report seem very sure indeed that the immensely unequal power balance, state violence, and impunity are still on their side. The Tanzanian government hasn’t had any problems using this same rhetoric about mutual agreement between all stakeholders before, during, and after mass human rights crimes. The Science article does mention “an asymmetric historical relation’, since people were evicted from protected areas in the 20th century, while wildlife is still allowed to roam the village lands. Though the current situation is totally left out, without any mention that land outside the national park, in Loliondo, is village land per Village Land Act No. 5 of 1999, and decisions about this land are supposed to be taken by the village assemblies consisting of all villagers above the age of 18, which rarely happens. These are the people who should make the land use plans, and it isn’t explained why they, if left in peace, would not want to protect their own natural resources. Neither is there any mention of how the Tanzanian government, or parts of it, after all historical injustices, still has attempted to evict people from the 1,500 km2 of grazing land essential for pastoralist survival next to Serengeti National Park. OBC, that organises hunting for Sheikh Mohammed of Dubai and use the 1,500 km2 Osero (bushland) as their core hunting area, funded a draft district land use plan that proposed converting this grazing land into a protected area (protected from Maasai land use, but not from hunting). 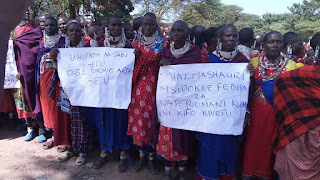 The land use plan was in early 2011 rejected by Ngorongoro District Council, but OBC, and others, just kept lobbying, and threats of different seriousness against the Loliondo Maasai are regularly issued. In the extreme drought year 2009, already before the land use plan, there were illegal evictions in which the Field Force Unit and OBC rangers set ablaze hundreds of homesteads on village land. A similar operation was conducted in 2017 by Serengeti rangers, local police and other rangers (OBC, anti-poaching etc.) with unbelievable brutality, and complete lawlessness and impunity. The government’s explanation for these operations has been the need to protect Serengeti National Park and the tourism industry. Local people have fought back, sometimes successfully, even though those speaking up have been viciously defamed and threatened. Some local leaders, and young educated people, have been sadly unable to resist the wealth of those lobbying for land alienation, while others seem to have been simply beaten into submission, suddenly pronouncing incomprehensible words of praise about those they’ve spent years resisting. There’s however only one Loliondo pastoralist (Gabriel Killel who has sometimes been featured in this blog) who, among other strange and violent behaviour, has expressed support for the alienation of the Osero. The past years repression has increased considerably with illegal arrests, and even malicious prosecution, for the sole sake of silencing everyone. Four villages, during the illegal attacks in 2017, sued the government in the East African Court of Justice, and in May 2018 there was an intimidation drive to derail the case, with arrests and summons to the police of leaders and common villagers, and in which village chairmen were prevented from attending a court hearing since they had to present themselves at Loliondo police station instead. The court ordered interim measures restraining the government from further evictions or destruction of property, and from intimidating and harassing the applicants. Despite this, Tanzania People’s Defence Force (JWTZ) soldiers, ordered by someone “unknown”, in 2018 brutalized villagers in wide areas around OBC’s camp and burned down bomas in areas in the villages of Kirtalo and Ololosokwan – and nothing at all happened, nobody spoke up … By now, Loliondo is such a police state that many people even fear sharing information online about the land threats believing that they are “hacked”, which probably is baseless since such measures aren’t needed to intimidate everyone into silence. The authors of the article in Science chose to ignore all this, even when at least one of them is deeply involved in the terror and repression. William Mwakilema, one of the co-authors of the article was the chief park warden of Serengeti in 2017 when rangers were tasked with unexpectedly and with total illegality and extreme brutality invade land bordering the Park, up to 5 km, and further, inside village land. Starting in the Oloosek area of Ololosokwan on 13th August 2017 and continuing all the way to Piyaya 90 km further south, hundreds of bomas were burned to the ground. There were brutal beatings, arrests of the victims, illegal seizing of cows, and blocking of water sources. The Serengeti rangers raped several women. Before the illegal eviction, in March 2017 while the Arusha RC’s (tasked by PM Majaliwa) select committee was working on a proposal for “solving the conflict” (between the Maasai and those who want to take their land), and when then Minister Maghembe was working hard for the alienation of the 1,500 km2 osero, Maghembe took the Parliamentary Standing Committee on Natural Resources and Tourism on a Loliondo tour so co-opted that several members complained about being used to rubber stamp the minister’s wish to hand the land over to OBC. During this co-opted tour there was a meeting, attended by the press, in which William Mwakilema told the standing committee members that development funds from the German development bank KfW for the “Serengeti Ecosystem Development and Conservation Project (SEDCP)” (implemented by Tanzania National Parks Authority (TANAPA) and Frankfurt Zoological Society (FZS) were subject to the approval of the land use plan proposing the alienation of the 1,500 km2 Osero – and this led to a manifestation in which 600 women marched on Wasso, and the District Council decided not to accept the German money, even though it sadly seems like the district chairman secretly signed anyway. Despite of several news articles, the Germans kept quiet and neither denied nor confirmed this information, and in the middle of the human rights crimes of 2017, a smiling German ambassador was seen all over media, in the framework of the SEDCP, handing over office and residential buildings for park staff in Fort Ikoma, in Serengeti National Park, to an equally smiling Minister Maghembe, while commenting on the long and successful partnership between Germany and Tanzania in protecting the Serengeti. Then, almost two years later in an interview with the websiteConservation Watch, Dr Klaus Müller, Director, and Dr Matthias Grüninger, Senior Project Manager at KfW replied,“German Development Funds implemented through KfW are not subject to such a requirement”. This means that either the heads of KfW or chief park warden Mwakilema are lying. Wasso, 15th March 2017, "Conservation is our tradition, OBC leave us our land" and ""District Council, don't receive money from the Germans, since it's death to us"
The RC’s committee in March 2017 finally reached the “compromise proposal” of a Wildlife Management Area, which means increasing the influence by “investors” and central government on the land while it nominally stays as village land. This had been rejected for a decade and a half in Loliondo, but at that time it was celebrated as a victory by all leaders (but very far from all other people). Maybe it was this weakness shown by leaders that encouraged the unexpected and illegal brutality with an apparent aim to crush all resistance. I don’t know. The PM’s decision came much later, after the human rights crimes, in December 2017, and was for a “special authority” to manage land in Loliondo, which then was explained as - via a legal bill to still allow hunting - placing Loliondo under Ngorongoro Conservation Area that’s under the colonial-style rule of the Ngorongoro Conservation Area Authority, and where subsistence agriculture is prohibited, grazing area after grazing area is alienated, and child malnutrition is rampant. People in NCA know about being “squeezed” (a buzzword in the media campaign around the Science article).This plan, which was much celebrated by the most anti-Loliondo and pro-OBC press, has fortunately been delayed and if there was any seriousness in the president’s statement of 15thJanuary, it must be stopped. I’d say that “hard edges” should as much as possible be avoided against wildlife, but are absolutely necessary against the malicious intrusion into Maasai land management by central government, “investors”, and international conservation. I hope it isn’t too late, that not everyone is worn out by the sheer terror, the silence, and the constant big and small betrayals. And, if there is a small possibility that the government is now looking to lessen the terror, nobody should have to put up with the authors of the Science article and their initiative to influence the Tanzanian government. Organisations involved in the study: AfricanBioServices Project, funded by the European Union’s Horizon 2020 research and innovation program and was also supported by the National Science Foundation (NSF), the German Research Foundation (DFG), the Natural Environmental Research Council (NERC), the Leverhulme Trust, the British Ecological Society (BES) and unsurprisingly the Frankfurt Zoological Society (FZS).